It is hard to believe that fall is now here. It seems that only yesterday we were starting the school year. Anxiety and excitement filled the dry summer air. Now, the cooler weather is starting to take a peek as our students, teachers and parents begin to settle into their daily routines. The students now feel at home in their classrooms and recognize the family they have formed with their teachers, classmates and the rest of the MDJDA community. There are less tears from the little ones as they say good-bye in the morning and more smiles as they realize this is the place where they belong. Last week we celebrated the International Day of Peace. It was a beautiful day full of learning and coming together as a community. The fall reminds me of peace, the inner peace all of us seek and the peace we should always strive for in the world. Pope Francis said, “make peace, create peace, be the example of peace. We need peace in the world.” As the fall settles upon us, let’s challenge ourselves to be the examples of peace for our students, our children and each other. I think Mother Teresa put it best when she said, “Peace begins with a smile.” I wish you all a wonderful fall season full of peace and smiles. I am truly blessed to be a part of Mater Dei Juan Diego Academy. These first six weeks have been full of welcomes, smiles, hugs and fruitful work. I have been working with teachers during weekly collaboration to continue to strengthen our academic program. We have worked together to create rigorous learning activities and more authentic standards-based assessments. I have also had the privilege to begin teaching a tech class to fourth and fifth grade students. Students are working hard on typing skills, exploring Microsoft Word and learning how to effectively use the internet as an educational resource. 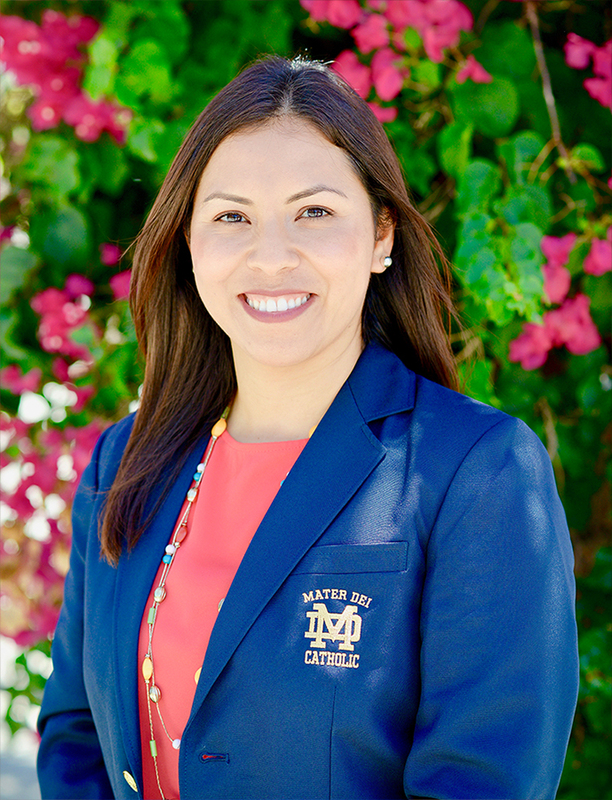 I am thoroughly enjoying the work I am doing with our teachers and students and look forward to opportunities to continue to serve all of the Mater Dei Juan Diego Academy community. Together with Mrs. Salter, we will also be planning a Religious Retreat for parents. 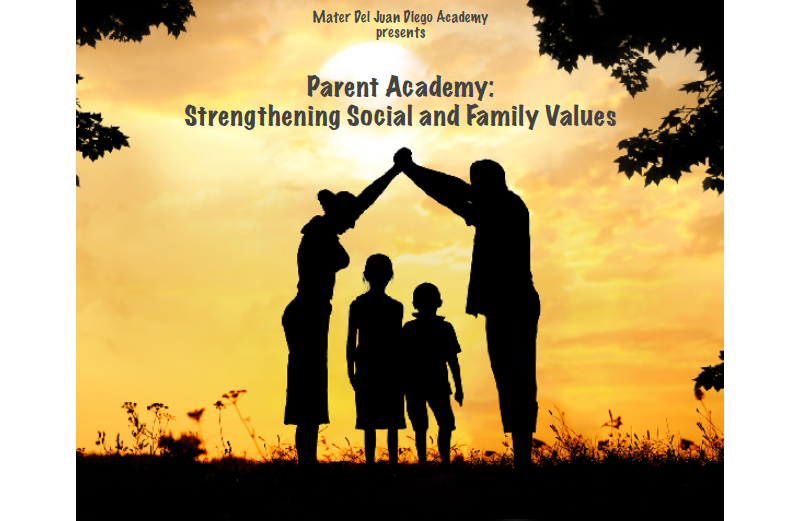 We look forward to continuing to support our parent community through these Parent Academies. This school year we are using Otus as our student information system (SIS). 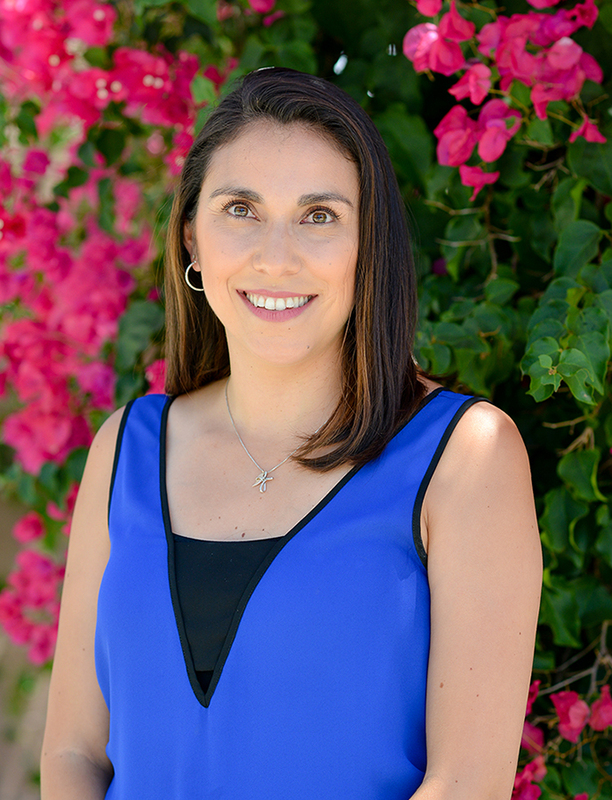 Otus facilitates communication between our school and families in the areas of behavior, academics, attendance and general classroom information. Each family will need to set-up their account and link their students to the family account using codes provided to them by their child’s teacher. The flyer provides directions on how to create your family account. Teachers will provide the student codes the week of October 1st to all the families so they can link their students to their account. Please also note that teachers will now be posting their newsletters in Otus for you to review, as well as homework and other announcements. JDA'S LIBRARY CORNER HAS A FRESH NEW LOOK! Over the last few months the JDA corner of the Mater Dei Library has undergone a fresh and fun makeover! 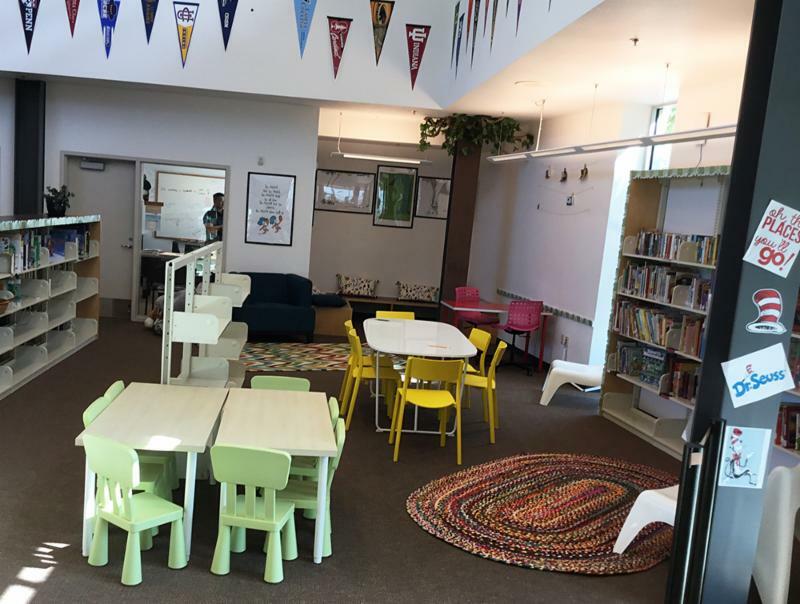 New furniture was purchased, which include reading chairs, a teepee for students to read in, bright new area rugs, pillows, and workstations. We’ve installed computers with fun math and reading apps for students to use, and there are new library books as well! We would like to open this space to our students to use during our lunch recess hour so they can take advantage of the fun new space, but we will need parent volunteers in order for this to happen. Please click on the link to sign up. Our grand re-opening will take place on October 25 with a “Family Reading Night”. We’ll have refreshments, music, and giveaways. We hope you will join us! Our Open House will take place on Sunday, October 21 from 11:00am to 1:00pm. We ask that you please help us promote this event. We will be sending home postcards for you to distribute to friends, neighbors or family members that you think might be interested in joining the MDJDA family or in finding out more information about our school. We are also looking for parent volunteers who can act as parent ambassadors to help us greet families and offer a parent perspective. Please let us know if you are interested in volunteering that day by contacting Mrs. Figueroa. 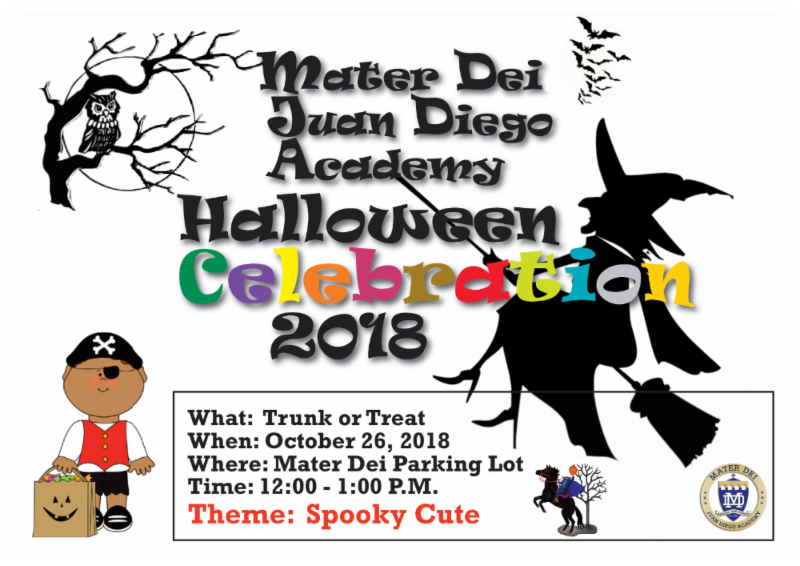 Trunk or Treat will take place on Friday, October 26 on the Mater Dei Parish parking lot from 11:45am to 1:00pm. Please note that it takes place on a Friday, in order to have a full day of instruction on Wednesday, October 31. Students will dress up on Friday, October 26. They will come to school already in their costumes. Please make sure that the costumes are school appropriate, no references to violence and no masks, and that their shoes are safe for school. Please read the flyer for more information. We will send sign-up information to parents regarding Trunk or Treat soon. You may drop off students starting at 8:00am. There is no supervision before then, therefore any children being dropped off before that time must remain accompanied by an adult or go to ECEP. ECEP opens at 7:00am Monday through Friday. The gate will close at 8:15am. At that point, parents do have to park and walk their students into the office where they will be issued a late slip. All students need to be in their classrooms by 8:15am. Pull up as forward as you can to allow more cars to enter the roundabout. Make sure the students exit the car on the right hand side only (the passenger side). Make sure the students have their backpacks and any other supplies with them (not in the trunk). Make sure the students are ready to exit the car as quickly as possible. Be aware of your surroundings. Don’t cut in front of other people. Be respectful. Feel free to drop them off at the gate. If you walk them to their classrooms, please say good-bye at the door. Do not enter the classrooms or have long conversations with the teachers. Teachers have to devote their full attention to the students at this time. Tutoring in English Language Arts, Spanish Language Arts and Math has started. Teachers have been evaluating students and assessing their needs. They have identified those students who are in need of this resource the most. These students will receive tutoring for six weeks. At that point teachers will re-assess and determine which students continue, withdraw or are added to the after school tutoring group. Please note that we cannot offer it to everyone because then the quality of the service will decrease as the number of students increases. At this point, this is a targeted support for those students who are struggling and need that extra help. Teachers will contact families directly to inform them if their student has been identified as someone who would benefit from this targeted support. 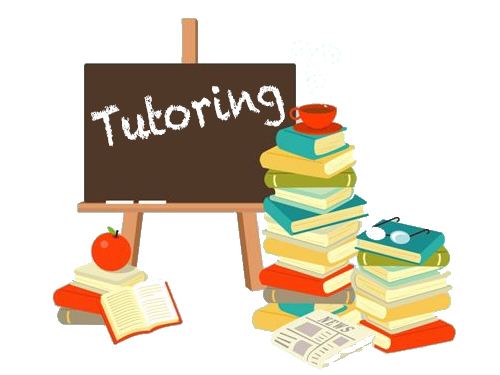 Tutoring is now being lead by a teacher with the support of one instructional aid and high school student volunteers. 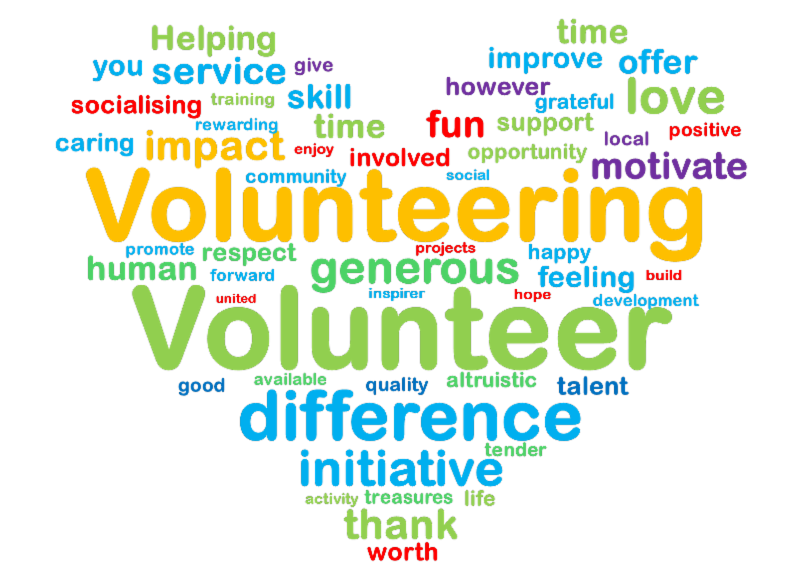 Please remember that all parents who want to volunteer in any capacity must be cleared. Please contact Mrs. Figueroa for all the details of this requirement. Please help us supervise our students during lunch time and recess. Please help us supervise students during recess in the library. 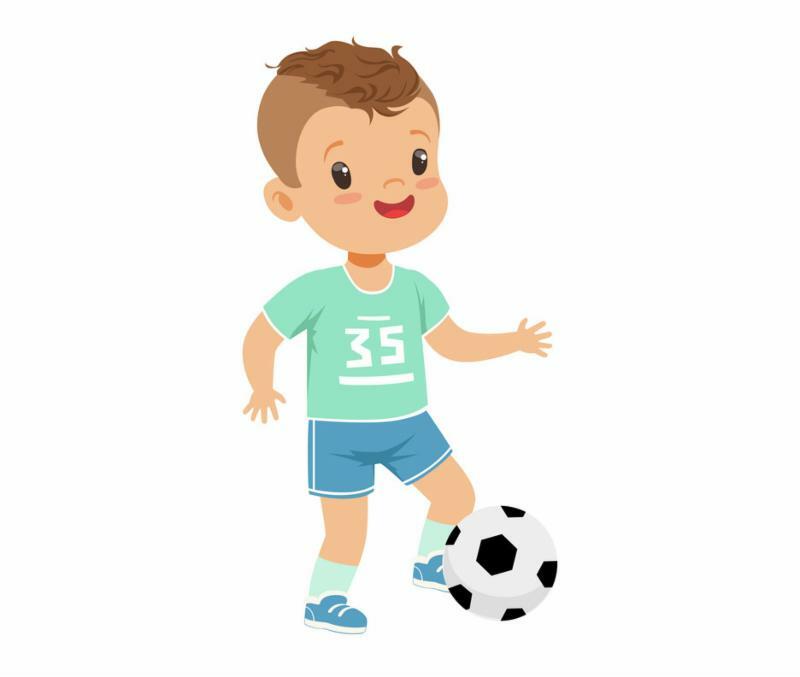 Please help us coach one of the soccer teams. Please remember to place your order for the following week by emailing schoollunch@mdjda.org by Sunday at 6:00pm.